In How to Manage Your Career to Make Millions More I listed seven steps to making the most of your career. Today we will be going into details of step #3: network. Networking is a very broad topic. Many, many books have been written on the subject and I’m sure more will follow. In this post we’ll just look at the basics (over the life of the blog we’ll dig much deeper. First we will cover the “why” of networking and then get into the “how”. You’ve all probably heard it quoted that the vast majority of jobs are not advertised and are placed by people knowing and recommending people, not by online ads or postings on company websites. As such, having a broad network is a great source for job leads, whether you are actively looking or not. In this way networking is a key part of career insurance. But finding a new job is not the only reason for having a solid network. Your relationships can help with a whole host of issues from business (getting a meeting with the right person, getting expert advice, and so on) to personal (getting a college connection for a child, asking for investment advice, etc.) 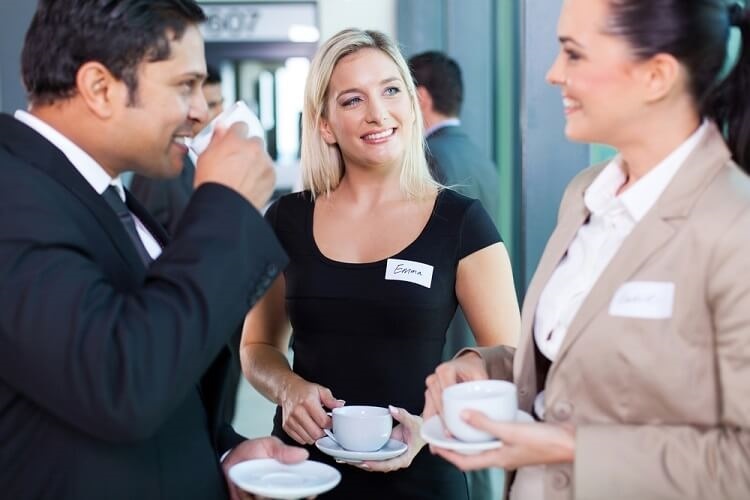 This part of networking is often overlooked but can be very valuable. There are really two parts to the “how to network” question: 1) where to find contacts to network with and 2) the “art” of approaching people to connect. LinkedIn — Obviously this social media platform is made for networking. So take full advantage of it. I have found people to be very willing to connect even if you don’t know them that well. I review LinkedIn every day, keep my profile updated, and post/comment on pieces when appropriate (but not too much — maybe a couple times per week). Everyone I meet professionally I try to connect with on LinkedIn. So far I have accumulated over 1,700 connections and look to add more each week. Work (inside and outside company) — You should be networking with fellow employees at all levels (above, below, and at same level as you). In addition, people you meet at work but are not part of the company (suppliers, sales reps, etc.) are also great sources for connections. I funnel all of these into LinkedIn. Volunteering — I can’t list all the ways my career and personal life have been helped by the connections I’ve formed through volunteering. When you are working on a cause with someone, you are “in the trenches” together. And when a business opportunity or need comes up, you have a pre-developed relationship that makes asking for (and getting) help much, much easier. Social networks/organizations — What groups do you belong to? I’ve networked at church, soccer meetings (I was a referee for years), and even at a neighborhood picnic for our housing association. I can’t tell you how many people I’ve connected with in the steam room at my health club. Wherever people are, you can network. Alumni — Most people like and want to help others who went to the same school they attended. So connect with these people. Friends and Family — Family kind of goes without saying, but friendships developed anywhere can have networking implications. I’ve made business connections at the pool (swim group), my son’s basketball games, and over at a neighbor’s party. These are just a few of my ideas. I’m sure ESI Money readers can add many more. Don’t go out “on the hunt” with the purpose of only benefiting yourself. Networking works best (and naturally) when you 1) are simply interested in people and 2) look to help others first before you ask for help. Be thoughtful. When you ask for help, understand that other people have lives to live. Don’t become frustrated when they don’t return your calls/emails within five minutes. Giving other people grace and the benefit of the doubt will go a long way. Be polite. This should go without saying, but many today have forgotten how to say “please” and “thank you”. Use them generously. Get out there. I avoid “networking lunches” and the like — those are fake events that I despise. But you do need to attend industry events, seminars, company outings, and so forth. Get out where people are, be friendly and interested in them (and interesting yourself) and you’ll be networking naturally. Keep at it. Networks build best over time. Have a plan/goal. A solid network is built intentionally. Develop a plan for meeting and getting to know others that works best with your personality. I focus mostly on LinkedIn, lunches with colleagues (I invite others out for lunch and treat them), and connections in casual situations like the gym or at church. Those are a few my tips. In a future post I’ll list several examples of how networking has helped me throughout my career. What about you? Do you have any networking tips for the rest of us? The saying that your Networth = Network is so true, there are so many opportunities that come from ones network. Very good tips on networking and it’s something that I/We are trying to utilise more and more. Linkedin is definitely something we want to use too.